I don’t know about you, but I’m so glad to be back to a normal eating pattern; the holidays absolutely wore me out this year. The decorations are packed and put away, and after 9 long months of helping our daughter and son-in-law renovate an old house, they moved in this past weekend. The garage is now empty, my car is actually back where it used to live, and we have our weekends free once again. I’m not complaining though, we loved helping them and learned a lot. I personally learned I never want to flip houses. I’m getting too old for all that work! I’m actually pretty excited to get on a meatless Monday theme once again. Eating right feels so much better! But don’t despair, we’re being good MOST of the time, but are also “saving room for dessert.” To get things started in the right direction I chose this wonderful, delicious, make-ahead pilaf loaded with mushrooms, onions and a wild rice blend. Did you know that the highly nutritious grain ‘wild rice’ is actually a seed, not rice? This recipe calls for a wild rice blend and you can find it pre-packaged in a box, or bag, or in the bulk bins at your better grocery stores. 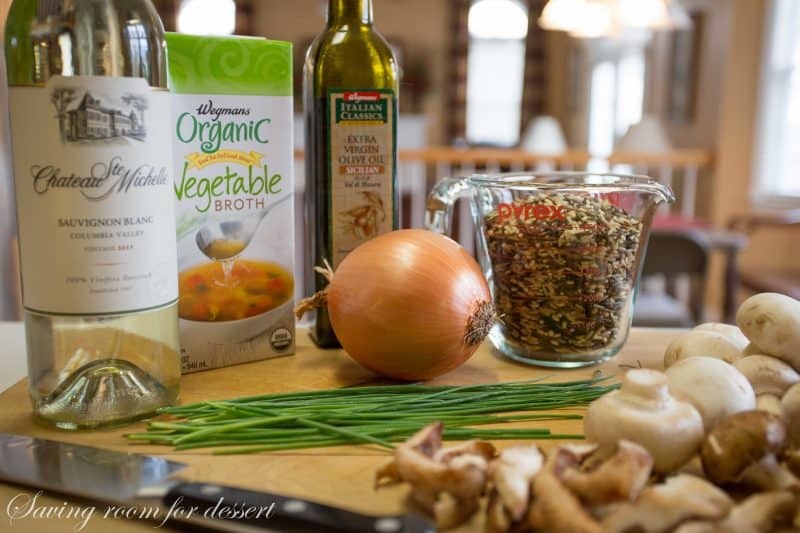 In addition to the wild rice blend, you’ll need an onion, chives, mushrooms, vegetable broth, wine and olive oil. I used a variety of mushrooms including shiitake, button and cremini. I used the biggest frying pan I own and still crowded the mushrooms. Julia would say “don’t crowd the mushrooms.” Sorry Julia! Saute the mushrooms until they turn brown and all the wine has evaporated. Garnish with fresh chopped chives and serve with a crisp light salad for a delicious weeknight meal, completely satisfying and meatless! An easy and delicious make-ahead side dish. 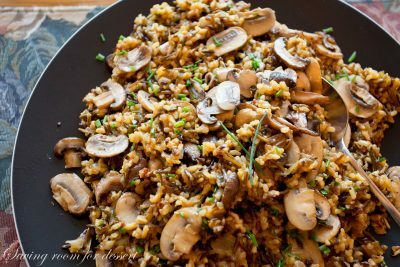 Loaded with a variety of mushrooms, this pilaf is filling with a nutty flavor from the wild rice blend. Heat 1 tablespoon butter in a large, heavy bottom saucepan over medium heat. Add the onion and 3/4 teaspoon salt and cook, stirring often, until softened, about 5 minutes. Add the wild rice blend and saute, stirring constantly, for about 30 seconds. Add 4 cups of vegetable broth to the rice and onion mixture and bring to a boil. Cover and turn heat to low and cook for 45 minutes or until the broth is absorbed. While the rice is cooking, prepare the mushrooms. Heat a large skillet and 2 tablespoons olive oil over medium-high heat. Add the mushrooms, 1/2 teaspoon salt and 1/2 teaspoon pepper. Cook, stirring occasionally until browned, about 8 minutes. Add the wine and cook until evaporated, about 4-5 minutes. When the rice is done, fluff with a fork and fold in the mushrooms and chives. Serve, hot or room temperature. May be made up to 2 days in advance. Refrigerate leftovers. I have so many recipes I want to try this year but before I get carried away, do you have any special requests? I plan to make more cookies, everybody loves cookies, and we want to stick with this meatless Monday format as well. I love getting your feedback on recipes, and am happy to answer any questions – so ask away! Thanks so much for stopping by – 2015 is going to be great! This recipe looks so amazing. I will definitely be trying it. Do you have nutrition info? Hi Shara – no I don’t have that feature on my recipe card … yet! Enjoy the pilaf! I am planning on making this for a dinner party next weekend. When you say wild rice blend, are you talking about a boxed rice like Uncle Bens? Or will I be able to find a wild rice/white rice mixtures on it’s own? Thanks in advance! Hi Rachel – Great question! You can usually find wild rice blends in the bulk section of your grocery store or in boxes, like Uncle Ben’s, which is fine for this recipe! You can use all wild rice, which is also available in boxes if you prefer. Hope you enjoy! This looks so amazing, I was on Pinterest looking for a ‘rice’ side dish to add to my Xmas menu and I think this is it. Will let you know how the family likes it. Thank you. Delicious. I added some garden carrot to cook along with the rice and it was great. I didn’t have parsley or chive, but I sprinkled some chopped fresh cilantro over top before serving and paired it with broiled marinated shrimp and a nice Pinot Gris. Yum. Thanks Chris! Your adaptations sound great. Thanks for trying our recipe! This was amazing! Instead of pilaf though, I used all cracked wild rice. 1 cup rice to 4 cups broth. 45 min was perfect! I will definitely be making this again! Thanks! That’s great Kesha! Thanks so much for letting us know. I love this earthy flavor and wild rice is so delicious. Thanks again for trying it and for letting us know! I made the wild rice and mushroom pilaf for my husband tonight and it was so delicious!! Thanks so much. Thank you so much Leslie – I LOVE it too. I really appreciate the feedback. Happy Holidays! Great recipe! We are trying to eat healthier, mainly cutting out processed foods including our long time favorite Uncle Ben’s wild rice. This was the first time I prepared wild rice from scratch, and the recipe was perfect! I didn’t change a thing, except to cut it in half for just 2 people. My husband loves mushrooms, and although I do not like them, I often add them just for him. And these were big enough for me to pick around. He loved it, and already asked when I would be making it again! I love this recipe Debby and appreciate the feedback. This is a keeper 🙂 Thanks for reading and commenting! I agree, it is nice to get back to our normal life. Your rice pilaf looks delicious and healthy. My husband loves rice. Thanks for reminding me that wild rice is a seed. Have a relaxing weekend. Thanks Gerlinde – you too! 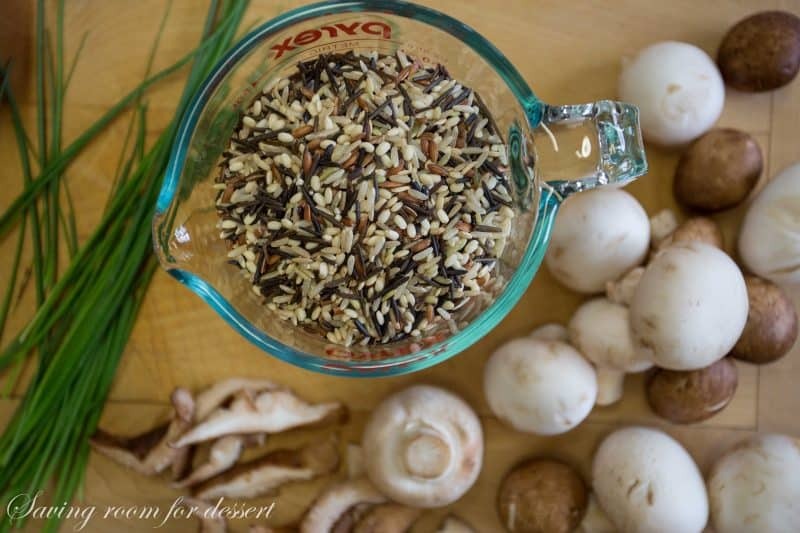 I absolutely love wild rice and it just seems like mushrooms were made for wild rice and rice pilaf! I only started cooking wild rice at home less than a year ago but now I always keep some on hand to cook up every so often. I just love anything with nuttiness and a good chewy texture or bite to it. 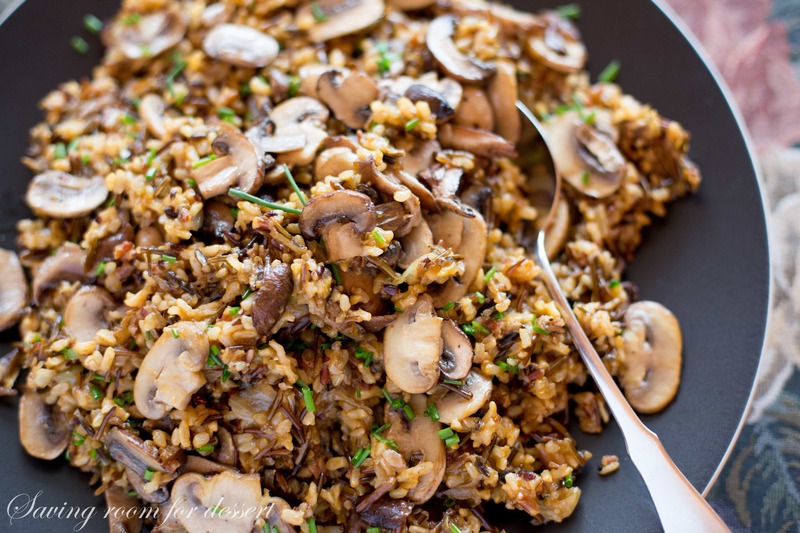 I could eat your mushroom pilaf everyday for weeks! It looks insane! I love the nuttiness too – hope you give it a try Monica. My husband would marry me all over again if I made him this, he’s a mushroom lover! He would love this dish then! Mushrooms combine beautifully with the nutty wild rice. Enjoy! I have a wild request. 🙂 To go along with the wild rice, I guess (which looks absolutely delicious — I plan to make it for me and my mom the next time I visit her in a few weeks). I have a recipe which I enjoy and don’t make often enough. I’m attaching it here. I found it a long time ago, maybe in a magazine. I wondered if you’d like to try it and maybe post about it if you enjoy it. It’s really great toasted for breakfast, and particularly good with cream cheese. Maybe you can think of something to add in other than raisins; but it is good as is, and healthy. It will look like too much for one loaf pan, but if you use a large loaf pan as described it works great. After it sets for a day in the refrigerator, it settles down to a toast-able size, and is almost reminiscent of Boston Brown Bread, but I like it better. Mix milk, honey and molasses. In another bowl, mix flours and salt and soda. Add to milk mixture, and stir in raisins. Pour into a greased 9 x 5 x 3″ bread pan. Preheat oven to 400, then turn it back to 350.
or use plain as wanted. Excellent with cream cheese. I feel the same way! We are so ready to forgo the holiday desserts and start eating more whole grains and veggies. This looks so delicious! I can’t wait to try it being the mushroom lover that I am. Thanks Susan – hope you love it – we did! this dish is one of my daddy’s favorite. of course growing up my grandmother didn’t call it a pilaf but just brown rice and mushroom casserole but honestly it was the same thing as a pilaf in terms of how she made it. to this day its a favorite dish of mine as well! Whatever you call it – it is our new favorite way to eat mushrooms and rice. 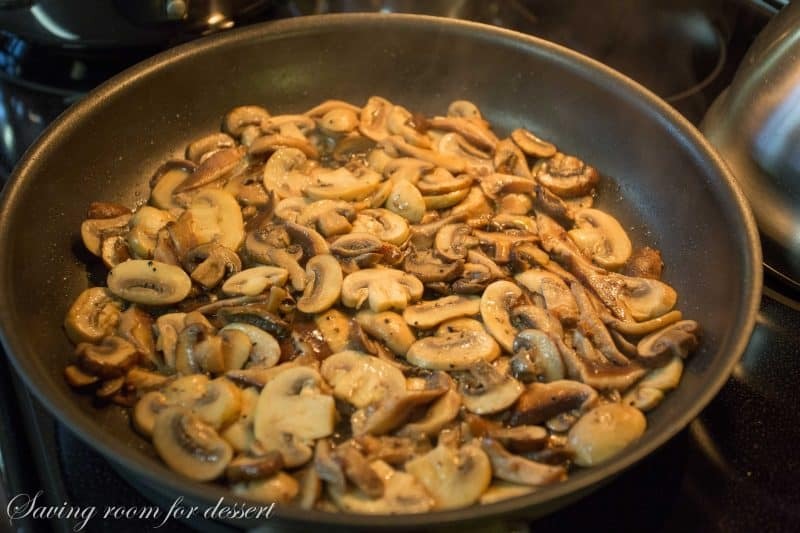 I love the nutty flavor and creamy earthiness of the mushrooms – outstanding! ps… congratulations on finishing up on your daughter’s home! Whew! It is a BIG job. I had my spot in the garage for about a month… now, I’ve lost it again! LOL! Tanna – I have missed you so much! Thanks for coming back – you are a blessing to everyone. More one pan meals – you’ve got it! Soups too – I just love soup! i love wild rice. this looks like something great to rustle up with the last of the wild rice in my pantry. Thanks so much for stopping by! It is nutty, filling, healthy and delicious! Happy 2015! HI Tricia, what a great way to start out the new year, I love mushrooms! I love mushrooms too and wish I ate them more often – guess I gotta change that! Hope you are feeling better! I NEED this in my life too. It looks so darn good with mushrooms. O yes, I am a fan of all different kinds of mushrooms. 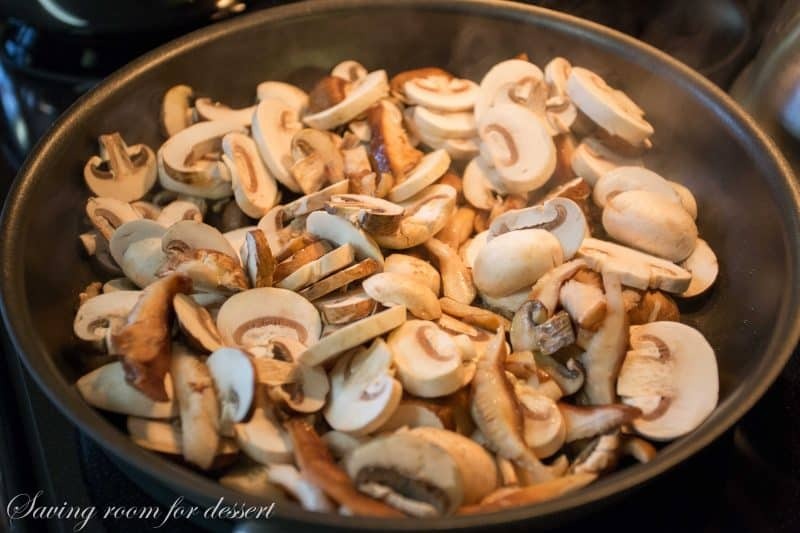 Hi Tricia, just came across this delicious sounding mushroom recipe, I was wondering what is the best way to reheat it if making ahead? Hi Jan – this is such a good recipe – glad you picked it to try! I would recommend reheating in the microwave on 50% power. It doesn’t have to be super hot and you don’t want to hurt the mushrooms by overcooking. Add a little extra wine or vegetable broth if needed to retain a little steamy moisture. Hope this helps and thanks so much for the wonderful question! Happy Thanksgiving and thanks again.